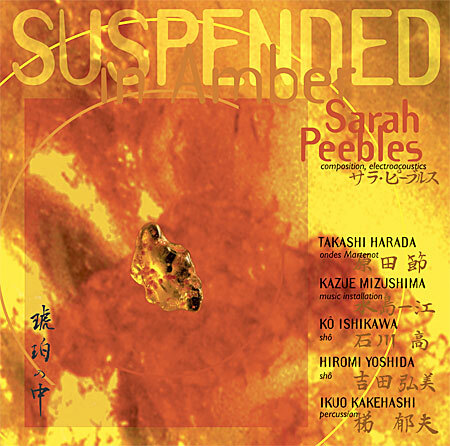 Suspended in Amber is a collection of collaborations developed in 1992-1993 by Sarah Peebles with a wide range of Tokyo-based audio, visual and dance artists. The works here are from live performances involving written composition, "comprovisation" performance-art and free improvisation. Sounds sampled in Japan and North America's rural and urban environments intermingle with traditional Japanese instruments, sound installations, vintage electronics, and ambient rural soundscapes. 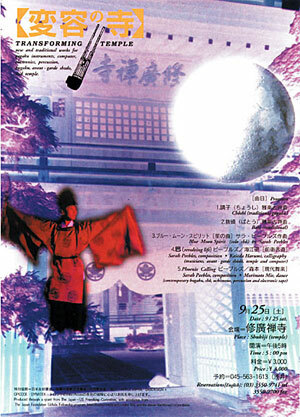 At the heart of the CD are works recorded during “Transforming Temple”, a concert at Shukohji, a small temple set in a semi-rural pocket of Kawasaki’s urban sprawl. The concert experience, sequenced to take the audience on a journey from outdoors to indoors and back out again, highlights the soundscape of Shukohji’s ringing Autumn insects intermingled with acoustic instruments and amplified sound, where shifting placement of the temples’ traditional sliding doors and moving performance locations accentuate the relationships of sound sources — masterfully recorded by Tsotomu Sudo. Influences of gagaku (court music), folk toys and the sounds of displaced creatures create an evocative, sometimes bizarre, and often poignant sonic experience. 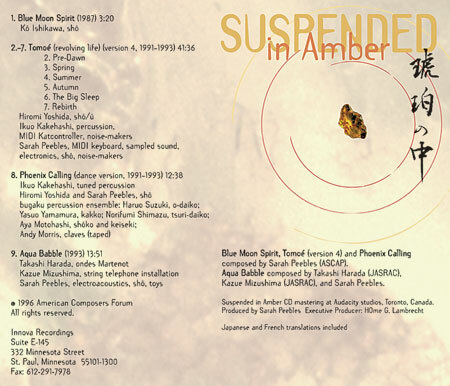 Performers and co-creators on Suspended in Amber represent a sampling of some of Japan's finest experienced, as well as emerging talents. Takashi Harada (appearing courtesy of JVC), internationally-acclaimed performer on the ondes Martenot, has appeared with leading orchestras, and has extensively performed and composed for NHK and numerous other musical groups. His repertoire covers a wide range of 20th-century works and runs the gamut of musical genres. Praised by Alvin Lucier as "one of the most talented and original young composers in the world today", Kazue Mizushima is gaining stature as one of Japan's most intriguing installation artists and composers of her generation, with works spanning concert hall, outdoor, theatre, dance and performance-art contexts. Among a small and virtuosic number of exponents of new music for gagaku and revived ancient instruments, are Ishikawa Kô and Yoshida Hiromi, who have performed works by such composers as Takemitsu, Ichiyanagi, Hosokawa and Cage throughout Japan and internationally, and who regularly premier new works for ensembles of ancient and revived instruments at The National Theatre of Japan, with Reigakusha and other ensembles. The collaborative contributions of percussionist Kakehashi Ikuo, bugaku (court) dancer Morimoto Mie, calligrapher Kaieda Harumi and video installation artist Higuma Haruo are also central to the creations presented here. Sarah Peebles has composed for electroacoustics, small ensemble, dance, animation, inter-disciplinary collaborations and music-theatre. Exploring alternate performance settings, such as museums, bamboo groves, temples and parks, her work also encompasses "comprovisation" and performance art. Originally from Minnesota, she resided in Japan over extended periods where she studied Japanese court music, Shinto festival music-drama and trends in the Japanese avant-garde. She lives in Canada as an independent composer, radio programmer and new music organizer, focusing on electroacoustic music and computer-assisted performance.